Other 10% Supply Chain, Logistics, Marketing, HR, Warehouse, Finance, etc. 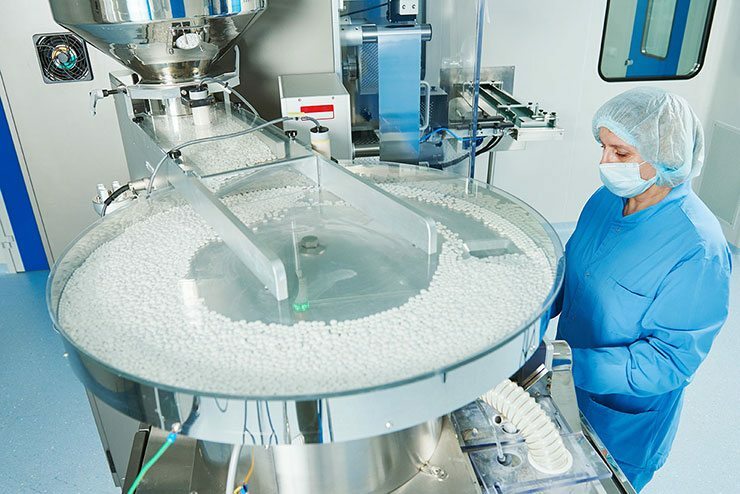 Deal with all stages of pharmaceutical product manufacture – from producing active ingredients, through to completion of finished products and even packaging. Due to this diversity, work in this area can take many forms and involve the use of specialist machinery. These production processes are all carried out in strict adherence to both internal and external protocols. Upstream activities are stages of biopharmaceutical processing up to the cell-culture or fermentation process that is used to make the target proteins. Supports operations with activities such as continuous process improvement, implementing new technologies and troubleshooting. Average 10% of total company employment. Some of the final stages of the manufacture process where the active agent is prepared into its final form, before being filled and sealed within containers. Average 10% of total company employment once at full production. Functional area that monitors and documents activities, processes and products of manufacturing to ensure they meet strict standards and predefined expectations. Ultimately, this team ensures the safety of the drugs that go out for distribution – their activities are essential within such a regulated industry. Quality Assurance – focuses on eliminating process variation by creating, revising and strictly implementing a set of tightly and precisely defined process/procedures/checklists/quality system standards that when exactly followed, ensure the final quality of the product. Quality Assurance is preventative by nature and makes sure you are doing it “Right First Time”. Quality Control – is product oriented and focuses on testing a sample of the final product of a manufacturing process to make sure that is meets the required design specifications or quality standards. Testing for quality can be done with a 100% sampling or with a small sample using techniques like statistical process control (SPC). Ensures the continuous functioning of the manufacturing plant and its equipment. Technical service covers areas such as maintaining the building infrastructure, facility management, equipment and electrical maintenance, instrumentation and calibration, HVAC (heating, ventilation and air conditioning) to ensure a sterile cleanroom atmosphere, providing clean utilities such as steam, water and compressed air. Covers areas such as information technology, multiple system integration, using automation and control (installing, programming and maintaining PLCs) to oversee or manage the manufacturing process and streamline it to make it as efficient as possible. Where staff are engaged in making improvements and modifications to existing production processes and identifying possible new production technologies and applications. Includes areas such as Supply Chain, Logistics, Marketing, HR, Warehouse, Finance, etc.